Envelope Channels are percentage-based envelopes set above and below a moving average. The moving average, which forms the base for this indicator, can be a simple, exponential, front-weighted or Hull moving average. 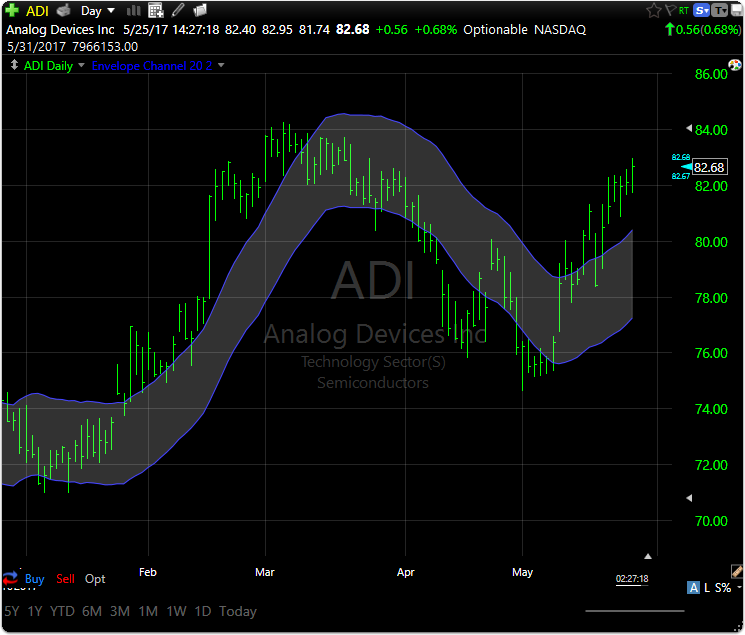 The top and bottom channel lines are plotted the same percentage above or below the moving average. This creates parallel bands that follow price action. With a moving average as the base, Moving Average Envelopes can be used as a trend following indicator. However, this indicator is not limited to just trend following. The envelopes can also be used to identify overbought and oversold levels when the trend is relatively flat. You are not limited to plotting envelope channels on price. They can also be plotted on any other indicator on the chart and will use the indicator as the basis for the moving average calculation instead of price. 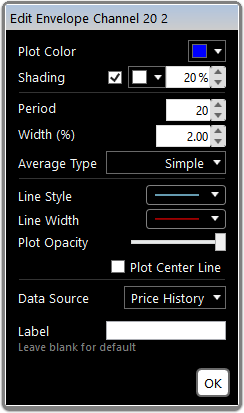 If you want to see the moving average used to calculate the channels, select the Plot Center Line option. Where w is the Width (%) setting. Where v is any formula returning a numeric value. The top simple Envelope Channel 20, 2.00 can be written as follows. The bottom simple Envelope Channel 20, 2.00 can be written as follows. The center simple Envelope Channel 20, 2.00 is just the 20 period simple moving average.